NEW DELHI -- A day after Indians marked the holiday of Diwali by setting off firecrackers in huge numbers, a toxic smog has covered the capital city. Pollution levels were at “hazardous” or “severe” in most parts of the city Monday morning. Data from India’s pollution monitoring agency showed pollutants in the air were as high as 42 times the safe limit. Particulate Matter 10 (PM10) density was above 1,600 micrograms per cubic metre compared to a safe level of just 100 in one New Delhi neighborhood. The finer, even more harmful PM2.5 particles were measured at 16 times the safe limit. The Air Quality Index (AQI) near the U.S. Embassy in Chanakyapuri -- one of the greenest patches in New Delhi -- was at 999, way above the safe limit of 60. A screengrab from the website of the U.S. Embassy in Delhi, India, shows Air Quality Index readings for various parts of the Indian capital on Nov. 1, 2016. Some Monday morning commuters in the Indian capital reported low visibility and breathing problems. Before Diwali, the Hindu festival of lights, Delhi-based think-tank the Centre for Science and Environment had warned of the possibility of diseases ranging from cancer to imbalance of hormones due to the carcinogenic elements in the smoke emitted by fireworks. Delhi has topped Beijing on the international list of the most populated cities. Pollution in the Chinese capital prompted authorities to issue a rare “Red Alert” last year. The pollution level is classified as “severe” if the AQI is between 401 and 500. China declares a “Red Alert” at this level, shuts schools and cancels outdoor activities. Last year, parents complained in Beijing, and asked why the measures hadn’t been taken sooner. In India, however, in spite of the warnings ahead of Diwali, the Delhi government failed even to make good on plans to set up air purifiers at several of the city’s most polluted spots ahead of the firework bonanza. But as the pollution spiked -- with isolated AQI readings near the 1,000 mark -- the city-state’s Deputy Chief Minister called a meeting on air pollution and declared his administration on a “war-footing” to address the problem. Air pollution is a serious health concern for Delhi. Have called a high level meeting at 1pm today, ro ensure work at warfooting. Delhi chokes on air pollution throughout the year; the Diwali fireworks aren’t the cause, they just make it much worse. Several other factors, including calmer winds and more moisture in the air had already begun clogging the sprawling city’s air days before Diwali. They both help trap emissions from vehicles and other pollutants at ground level, where the city’s approximately 25 million inhabitants are trying to breath. Pollution also tends to spike in the winter months as farmers in the neighbouring states of Punjab, Haryana and Uttar Pradesh burn off agricultural waste, sending thick clouds billowing over the city. 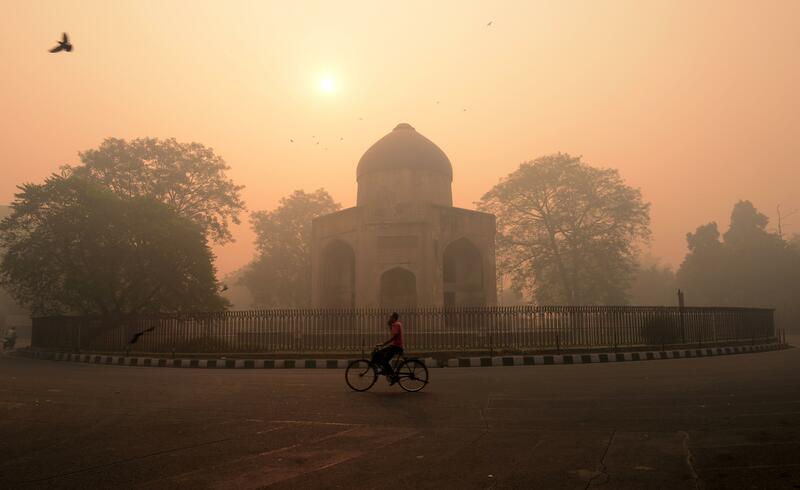 In a May report this year, the World Health Organization ranked Delhi as the 11th most polluted city in the world, but nine other Indian cities were among the top 20.